Pictured below is Myddelton Passage, a quiet road which pops out behind Sadler’s Wells Theatre. 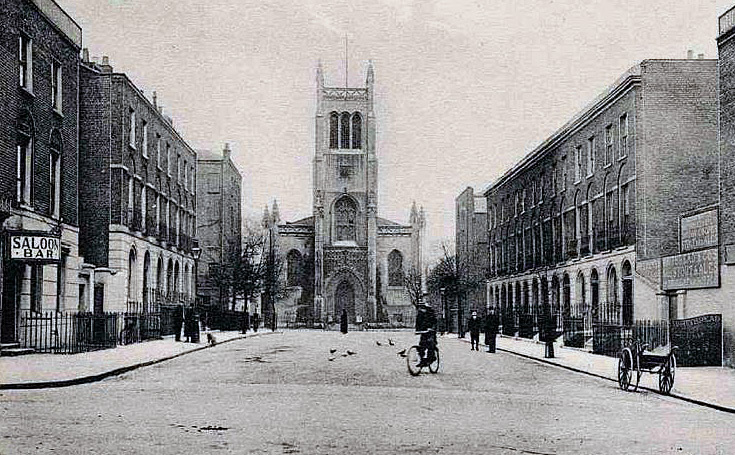 Initially a narrow footpath, the street was widened in the early 19th century as an estate of homes developed around nearby Myddelton Square, Claremont Square and Amwell Street. “There came running from the other end of the Passage a girl whom Pennyloaf at once recognised. It was Clem Peckover…who was now springing out of ambush. 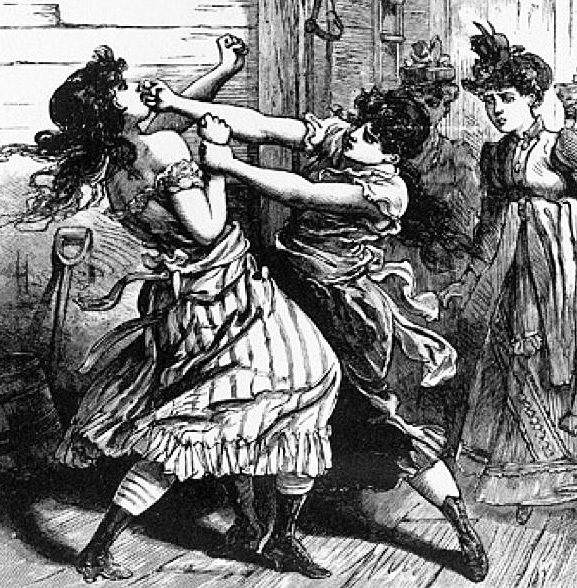 She rushed upon Pennyloaf who for very alarm could not flee, and attacked her with clenched fists. 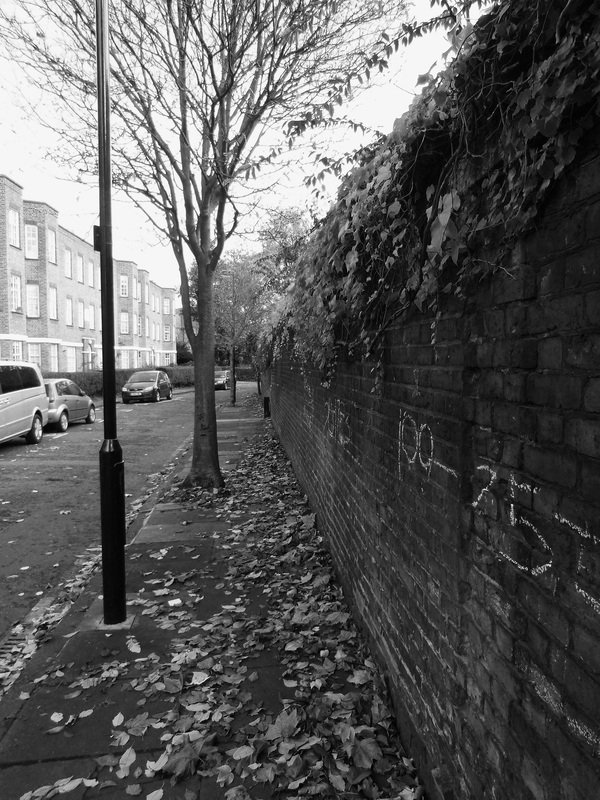 Today, Myddelton Passage has cleaned up its act; you can certainly walk along it of an evening without fear of attack. This large collection of seemingly random numbers were mostly carved around the mid to late 19th century by an array of police officers– with each set of digits representing the respective bobby’s collar number. Most of the numbers feature a ‘G’ linking them to ‘Finsbury Division’; the team who operated out of the former King’s Cross police station. I hope that they can shed more light on it. The Met history people have put out an appeal for more information on their site. 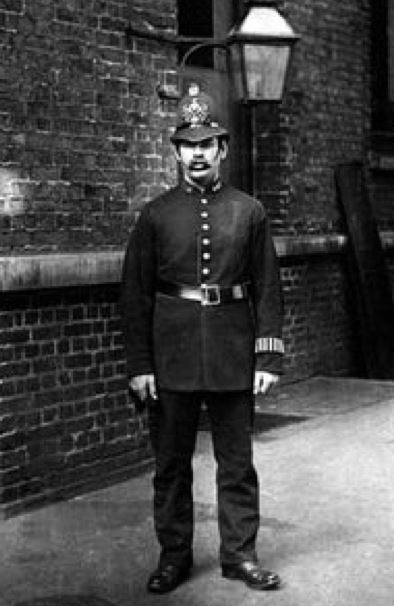 But their webmaster tells me that the copper in the photo is a City of London officer! I will let you know if they discover anything. Would love to hear what they find out. I have walked along Myddelton Passage a number of times and even taken photos there but, to my shame, had not spotted the inscriptions. So, today, despite the rain, I went for a look. What I saw intrigued me. 1. The inscriptions are confined to one area of the wall, approximately one third of its length, near the middle. 2. The inscriptions are densely packed in the middle but thin out towards the edges. More research might elicit an answer but in the meantime I can only make tentative suggestions. If the passage was considered dangerous, was a semi-permanent police presence maintained there at certain times, perhaps at night? Was this the place where the sergeant checked on his constables at certain times? Was this the point where constables met to hand over when the shift changed? In any of these scenarios, a constable might while away the time spent waiting by cutting an inscription. The densely packed part would indicate the actual meeting point and officers would stray from this only because they needed clear space. 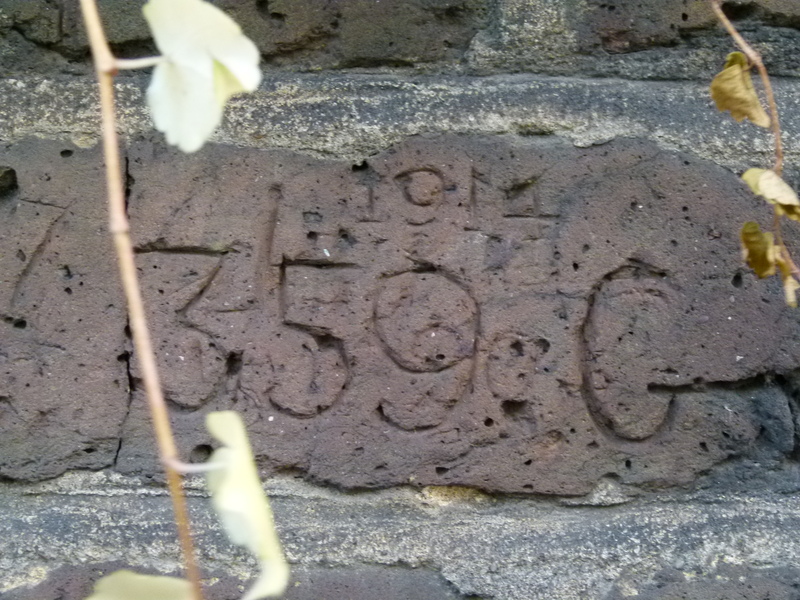 The fact that each inscription consists of a collar number, perhaps supplemented with the latter ‘G’, suggests that cutting one’s number here was something of a tradition. I think it would be worth submitting the matter to an historian as something interesting might emerge. Very interesting thoughts, SilverTiger… many thanks for sharing. Fantastic. A really interesting article, these relics from our past must be preserved. Thank you. The Friends of the Metropolitan Police Historical Collection http://www.metpolicehistory.co.uk are looking into this. Many thanks, Barry. Will be very interested to hear what turns up. I am an ex policeman. I was told that it was a regular posting due to the high rate of crime. They carved their numbers out of boredom. Perhaps Richard would like to leave his former collar-number with the Friends of Met Police Collection so they can identify him without any grafitti. He might then like to be recorded alongside the etchings, it would make for a great story in their newsletter. Thanks, Richard that would make sense. Really strange and wonderful. Why would the policemen have the urge to leave their mark ? Why so many ? Are they known to do this behaviour elsewhere ? Where do graffiti (tattoos) come from? I don’t get it.?? I’ve found graffiti interesting since visiting Pompeii and seeing examples there- and realising it’s been in human nature since ancient times! Going back to Policemen’s ones, they’re all pretty well crafted- must’ve taken each officer quite a while to make his mark. 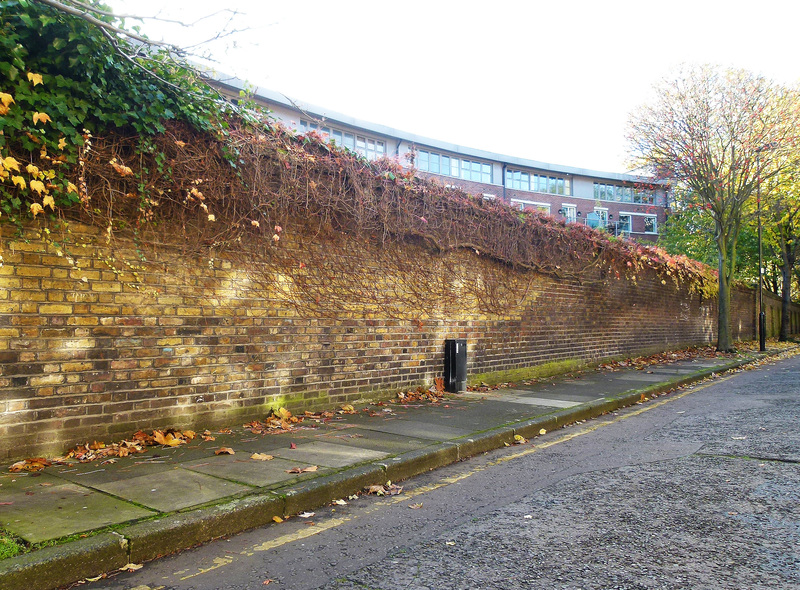 We lived in Myddelton Passage from 1976-86 and I only became aware of the walls curiosity from my window seeing people walking along the wall moving up and down like jack in the boxes which intrigued me. I then went to look for myself and read the numbers as either dates or numbers (as in prisoners) and had always assumed the wall may have been built from the bricks from an old local prison(newgate foundations etc),so am pleased to have had the riddle resolved. It certainly added character to where we lived with an interesting connection to London’s chequered history. An ITV london news program suggested a darker reason. 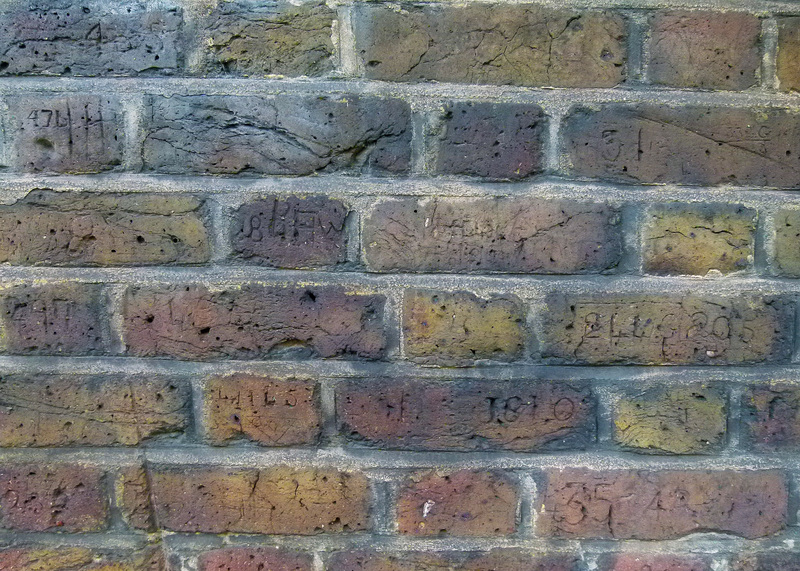 Was that the theory that prisoners from the Napoleonic War etched their numbers on the wall?